On switching on, the dial needles go to the extent of their travel then return to 0. A. 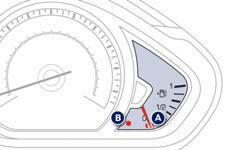 With the ignition on, the needle should indicate the fuel remaining. B. With the engine running, the associated low level warning lamp should go off. 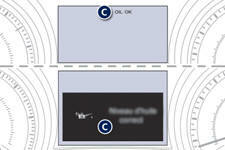 C. With the ignition on, the instrument panel screen should indicate the level of oil. If the levels are not correct, top up the level which is low.